Our hotel in Aswan was really nice. It seems every city we switch to the hotels will get nicer. We woke up around 8 and showered and went to breakfast. Breakfast was a hard-boiled egg, some oatmeal, juice and olives. I will never get tired of the olives here. We were meant to leave at nine but were held up again by people in the group. Our first stop today was the British Dam, which we drove over. Waleed explained that it hadn’t met all of the economic and other needs so later they had built the High Dam, which we went to see after. The High Dam is 7 times taller than the Great Pyramid. Some school children were there, on a field trip, when we got there. They got very excited to see westerners. They took pictures of and with us and excitedly told us “Hello!” When we left the girls smiled and blew us kisses. Waleed explained that meeting westerners for kids in Aswan would be like us meeting Barak Obama. After leaving the dam we got on a boat with a young man Waleed had known since the boy was 8. He had bracelets for sale for 5-10L.E. Roughly a dollar American. I liked this environment for shopping because there was no aggressive, negotiating or pushing other items on us, so I decided I would buy some. I found a pretty, feminine, hematite, bracelet and also one made of sandalwood that smells very nice. The boat took us on a short ride over to the Philae Temple, where there was, again, no shortage of cats. The temple was very interesting and we learned a lot of history about the Gods. While we were all sitting around listening to Waleed explain the creation story of ancient Egypt I got bit on the forehead by, what I’m assuming was a mosquito…and it BALLOONED! The Philae temple included a structure that the Trojans had built. There was also some script where the French, with Napoleon, had polished out Egyptian hieroglyphs and written French in their place. When we were done walking around the temple Nate and I ate some delicious ice cream bars that were half ice cream sandwich and half chocolate coating. (This was to be the first of what became our traditional, temple, ice cream stop.) Later, we took the boat back to shore, admiring the turtledoves as we went. My super attractive, forehead, bug bite had thankfully reduced in size by this time. Back at the hotel we had some free time. We decided to go sit by the pool and order lunch. We got pizza that came with veggies and eggs (hard-boiled) on top. It was really good. 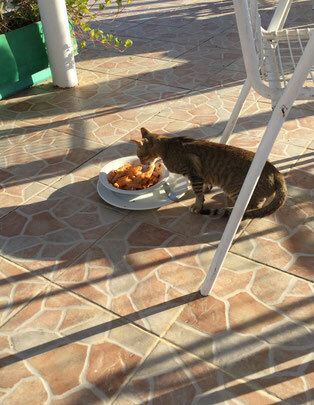 The table next to us didn’t finish their pasta so one lucky kitty got it, and loved it. I officially named him/her “Pasta Cat”. Nate took a dip in the pool but it was freezing cold so I opted out. Plus, it felt almost too weird to be in a bikini in a Muslim country; especially when my bikini body would not have been doing anyone any favors. We hung out in the room for about an hour before we met up with the rest of the group again. There was a popular night marker within walking distance, right across the street, from our hotel. Waleed walked all of us over to it and took us into a colorful spice shop. The owners were friendly and showed us the variety of spices they had available. Afterwards we were free to explore the market on our own. There were colorful lights strung up along the walkways and music played from inside the shops while people hustled and bustled around. Men gathered in hookah bars to watch sports and women shuffled along with their children. Everyone wanted us to come inside their shops but we were hesitant as we didn't plan on buying anything. It was fun to explore and see more of the local Egyptian culture though.